Sitting directly opposite the three women he has been accused of shooting at a protest last year, former Bavet town governor Chhouk Bandith smiled as he finally appeared in court yesterday, 10 months after he was first charged with the crime that has drawn so much unwanted attention to Cambodia. Bandith has kept a low profile since the three garment workers were shot in front of thousands at a protest outside the Kaoway Sports shoe factory in the town he then governed, and few expected him to actually appear at the Appeal Court yesterday. Just under two months ago, it seemed Bandith would never see the inside of a courtroom when the Svay Rieng Provincial Court dropped its charge of causing “unintentional injury”. But an Appeal Court prosecutor later called for a re-investigation amid public outrage. After deftly slipping past a press pack all but undetected, Bandith discreetly took his place yesterday and prepared to testify at what had been billed as an open session of court. But the media, rights groups, a monitor for the United Nations and industry observers were quickly ushered out of the court before a single word of testimony was uttered, leaving it up to those inside to recount the proceedings. Keo Near, 19, one of the three victims who was shot during the protest in Svay Rieng province, said after a five-hour hearing that Bandith had maintained he merely fired his gun into the air during the proceedings. She said Bandith claimed he had no intention to shoot the workers but that his gun had misfired while workers scuffled with him and police. PHNOM PENH (The Cambodia Herald) -- Phnom Penh Municipal Court sentenced Thursday a newspaper editor and his partner to three years in prison and a six million riel fine for forgery and defamation. The Anti-Corruption Unit arrested Ponleu Samki's editor in chief Hong Sakhorn, also known as Hong Chamroeun, and Phai Bunthoeurn last year. Hong Sakhorn was accused of extorting $70,000 from the children of a man for whom he was working. Phai Bunthoeurn was found to have made a fake complaint against anti-corruption unit officers. PHNOM PENH, 28 February 2013 (The Cambodia Herald) -- Cambodia's exports to Malaysia almost doubled from $55.5 million a year earlier to $101 million in 2012, the Malaysian Embassy said. Exports were led by crude rubber at $69.1 million followed by milled rice at $24.3 million, up sharply from $9.5 million in 2011 and only $0.4 million in 2010. A statement released Wednesday said Malaysia had a "keen interest" in diversifying its sources of rice imports. The embassy foresees "positive growth" in milled rice imports from Cambodia "subject to gradual development in quality and competitive pricing," it said. "Although, the modernization of the sector is still ongoing, the result in terms of quality (is) already visible. However, more efforts need (to) be done to develop (the) Cambodian rice sector to become more price competitive and sufficient in export production." PRWeb – The RACE organization is partnered with local business leaders in Cambodia to build Cambodian Aerospace Industries, Inc., the country’s first true aerospace company. This is the first of several technology/knowledge transfer programs RACE and its base of over 90 partners from the USA have planned for Cambodia. Phnom Penh, Kingdom of Cambodia (PRWEB) February 28, 2013 - The RACE nonprofit organization has partnered to build the Kingdom of Cambodia’s first true aerospace company. Unlike previous airlines, aircraft maintenance or manufacturing organizations created in the past, Cambodian Aerospace Industries, Inc., will be the first Cambodian company to be fully staffed by employees that are fully licensed by the Federal Aviation Administration (FAA). In order to achieve this, Cambodian Aerospace Industries, Inc. has partnered with RACE to donate millions in training programs, aircraft, simulators and other items needed to produce a world-class, professional accredited/certified aerospace training facility in Cambodia. As noted in several recent news articles and in press releases by Cambodia's Prime Minister, Hun Sen, the expansion of Cambodia’s aerospace sector is greatly needed to ensure the long-term stability and growth of tourism. RACE and several local government leaders have been studying the infrastructural needs of Cambodia for the past eight months. Mr. Mao, a former Khmer Rouge refugee was one of the many RACE employees that returned to Cambodia for this deployment. “I wanted to be part of something where I could use the skills I learned in the USA to help make a difference back home [in Cambodia]," said Mr. Mao. Mr. Mao has spent over eight months traveling across Cambodia collecting data for RACE’s support planning. “The RACE team developed the plans for Cambodian Aerospace Industries, Inc. and several other companies months ago, while secretly tucked away in the Dara Airport Hotel in Phnom Penh”, said Mr. Fioto, CEO of RACE. Today, 28 February 2013, the Cambodian Center for Human Rights ("CCHR") is releasing the third in a series of four Briefing Notes. Each examines key issues related to human rights in Cambodia: political and electoral reform; judicial reform; freedom of expression; and land reform. The attached Briefing Note - on freedom of expression - provides an overview of the situation of freedom of expression in the Kingdom of Cambodia (“Cambodia”) and suggests concrete recommendations for the adequate protection and promotion of the right. The crackdown on freedom of expression in Cambodia seriously threatens the progression, and even the survival, of the country’s fledgling democracy, as well as its lasting economic development. Considering the recent upsurge in severe restrictions on the right to freedom of expression in Cambodia, and with the July 2013 National Assembly Elections in sight, this Briefing Note recommends the following: 1) media should be free to report independently, and political debate encouraged, not punished; 2) the draft Cyber Law that proposes to restrict internet freedoms, especially freedom of expression, should be dropped; 3) aspects of existing legislation that threaten free expression must be amended or removed; and 4) judicial reform, including ensuring thorough education of legal professionals on up-to-date domestic and international laws, and punishment for corruption. Please find the Briefing Note attached in Khmer and English. For more information, please contact CCHR President Ou Virak via telephone at +855 (0) 12 40 40 51 or e-mail at ouvirak@cchrcambodia.org or Senior Consultant Robert Finch via telephone at +855 (0) 78 80 99 60 or e-mail at robert.finch@cchrcambodia.org. Union representatives gather to discuss minimum wage for workers, Feb. 26, 2013. The Cambodian government on Wednesday called on unions and employers to be flexible in their negotiations over an increase in the minimum wage for garment and footwear workers as the two sides remained poles apart following a second straight day of tense talks. Ministry of Labor Under Secretary of State Sat Samouth urged the two parties to “soften their stances,” calling on the unions to lower their demand and representatives of the Garment Manufacturers Association in Cambodia (GMAC) to raise their offer for a fair compromise. At a press conference during a break in talks, he told reporters that the government is optimistic the parties could agree by April for an increase in the minimum wage from its current rate of U.S. $61 per month. Union representatives had asked for the minimum wage to be doubled to U.S. $120 per month in negotiations on Tuesday, but reduced their bid to U.S. $100 on Wednesday, while GMAC representatives held fast on their offer of U.S. $72. Tourists visiting Ta Moan and Ta Krabey Temples where heavy fighting between Cambodian and Thai troops in April 2011 that killed at least 10 soldiers from each side. Details on the government’s acquisition of a new private airliner remained elusive on Monday with officials saying that only Prime Minister Hun Sen and State Secretariat of Civil Aviation Secretary of State Mao Havanall are privy to the agreement to procure the 150-seat French-made Airbus A320. CPP lawmaker Cheam Yeap—who last week said the government had purchased the estimated $91.5 million plane, then quickly retracted his comments the following day saying the plane was on lease—on Monday said that only Mr. Hun Sen and Mr. Havanall knew the specifics of the deal. “Samdech Hun Sen is the prime minister…and has the right to decide to lease it. I know that the Secretary of State of Civil Aviation [Mr. Havanall] is in charge of the plane,” Mr. Yeap said. “They know the details,” he said. “The prime minister appointed Excellency Havanall. He is going to sign that lease deal,” said Coun­cil of Ministers spokesman Phay Siphan. Mr. Siphan added that Mr. Havanall is the only official with intimate knowledge of the agreement, though he stressed that the Airbus, which made its inaugural flight on Thursday, was leased rather than purchased. “Only Havanall knows,” he said. Mr. Havanall has not responded to requests for comment since Thursday. Mr. Siphan said that during a Council of Ministers meeting on Friday, Mr. Hun Sen said the plane would be used exclusively by five individuals: the prime minister, Senate President Chea Sim, National Assembly President Heng Samrin, King Norodom Sihamoni and Queen Mother Norodom Monineath. Prime Minister Hun Sen yesterday offered praise for poor students and condemnation for wealthy scions, who too often waste the ample opportunities handed to them. “A few days ago, I heard that they chased to shoot each other. They have cars and they race, while the poor youths do not have even bicycle to ride,” Hun Sen said during a graduation speech at the National Institute of Education, referring to a story that appeared in local media about two rival gangs that chased one another in Range Rovers through the streets of Phnom Penh, opening fire as they did so. “We are regretful for people who have opportunity and do not use their opportunity,” he added. While Hun Sen’s children have avoided scandal, other relatives have not been as circumspect. At least two of his nephews have been arrested after allegedly firing shots at nightclubs – only to be quickly released. Another nephew served 10 months on manslaughter charges for allegedly shooting two people to death after a drag race in the capital. The conviction was later overturned. Please read her life story: Once a rising star, now a beggar. MOGILEV, 27 February 2013 (BelTA) – The Bobruisk-based mechanical engineering company Bobruisk Plant of Tractor Parts and Units has shipped a batch of proprietary compact tractors Belarus 321 to Cambodia for the first time, representatives of the company’s sales department told BelTA. In line with the contract, which was signed in early January 2013, the company shipped a total of eight Belarus 321 tractors in the first stage. Asked by partners and taking into account the delivery distance and the resulting costs, the company came up with a new scheme to load tractors. The scheme has halved transportation costs per vehicle. The solution will increase the competitive ability of Bobruisk-made machines on the markets of Cambodia, other Asian and African countries by reducing the prices the end customer pays. The shipment of the Bobruisk-made tractors to Cambodia is a new step in expanding the sales area in Asia. In the last two years compact Belarus machines were shipped to Iraq, Afghanistan, Pakistan, Mongolia, and Malaysia. Several days before the tractors were shipped to Cambodia, Bobruisk Plant of Tractor Parts and Units shipped two tractors of the new model Belarus 320R with a set of mounted and trailed tools to Vietnam. BelTA has been told that cooperation with the Cambodian partners has real grounds for further growth. The company is now busy getting ready to send the second batch of eight tractors to Cambodia. During border talks on Feb. 26, Cambodia claimed that Thai forces resorted to violence to prevent Cambodian loggers from illegally harvesting Siamese rosewood from Thailand, according to an article in the Bangkok Post today. While these attacks are nothing new, the Phnom Penh Post released figures from the Cambodian government claiming that 45 Cambodian loggers were shot and killed inside Thailand last year, three times the number killed in 2011 and five times the number shot dead in 2010. The Thai military denied the claims. Authorities in Thailand are also reported to have arrested 264 Cambodians for illegal logging offenses. Environmental experts say China’s demand for the rosewood has nearly wiped out the species in Cambodia, according to the Bangkok Post. This demand means a crew of loggers can cross into Thailand for a few days and earn the equivalent of $200 to $1,000—a sum that encourages poor villagers to take the risk. Felled Siamese rosewood tree. Photo from the Royal Thai Embassy in Washington, D.C.
PHNOM PENH (The Cambodia Herald) -- Former Bavet governor Chhouk Bandith appeared in the Court of Appeal Wednesday over the shooting of protesting workers in the border town last year. The three victims, 21-year-old Bun Chinda, 16-year-old Keo Nea and 23-year-old Nout Sakhorn also attended the hearing along with many human rights activists. After questioning the former governor and two of the three victims, the court adjourned the hearing until Thursday. Chhouk Bandith was first accused of unintentionally injuring the three workers from the Manhattan Special Economic Zone when he opened fire in February last year. Svay Rieng Provincial Court dropped the charges in December, saying the court didn’t have enough evidence. After a record high in 2011, deportations of Cambodians from the US dropped 42 per cent last year, according to figures obtained yesterday. In 2012, the Returnee Integration Support Center, an NGO that provides assistance to deported Cambodians, recorded 51 deportations. The year before, the centre fielded 88 − a spike that critics of the process attributed to a presidential administration attempting to look tough on immigration. Since January, just two new deportees have arrived – a pair who came in just last week – bringing the total number forcibly flown to Cambodia to 388 since the government first signed a repatriation agreement with the US in March 2002 to deport non-citizens convicted of felony-level crimes. Keo Sarith, a co-director of the support centre, said he could not explain the decrease, most of which occurred during the latter half of the year. “We’re not sure about this,” he said. He speculated that the 2012 election of President Barack Obama may have slowed the rate temporarily, or that Cambodian authorities had their hands tied dealing with the funeral arrangements for King Father Norodom Sihanouk. It can’t be attributed to the Obama administration’s pushing through of immigration reforms last year that applied to children of immigrants, because the reforms bypassed those convicted of crimes. Bilateral trade between Cambodia and neighbouring Vietnam increased by more than 10 per cent last year on the previous year, according to data from the Vietnam Trade Office in Cambodia. The data showed that total trade volume was $3.3 billion between January and the end of December, compared with $2.836 billion in the same period of 2011 – an increase of 17 per cent. The figures reveal that Cambodia’s total exports to Vietnam rose by 13.19 per cent to $486 million in 2012, up from $430 million in 2011, while total imports from Vietnam increased by about 18 per cent from $2.4 billion to $2.8 billion. Both governments pledged in June of last year to advance two-way trade, with the hope of ultimately reaching $5 billion in trade by 2015. “I do believe that, with the trend witnessed, we can reach the goal set by the two governments. In recent years, the two sides have been focusing on implementing effective measures to promote bilateral trade, especially in the facilitation of border trade,” Tran Tu, trade attache to the Vietnam Trade Office in Cambodia, said. Feb. 27 – In the third part of our ASEAN-India Free Trade Area analysis, we will examine trade trends and statistics from India to Cambodia, Brunei, Laos and the Philippines. While the Philippines is part of the ASEAN six majors, Cambodia, Brunei and Laos are the three smallest economies in the region. Together, these four countries combine for a GDP of US$258.30 billion, a population of 115.85 million and exports to India amounting to US$1.33 billion (or, about 0.27 percent of India’s total imports). India-Cambodia relations picked up in 1981 when India officially recognized Cambodia’s new government and opened up an embassy in Phnom Penh. In contemporary times, there has been an effort to expand their cooperation through institutional capacity building, human resource development, infrastructure development and security and defense. Furthermore, India and Cambodia have enhanced bilateral cooperation through increased interactions at regional and international forums. Positive relations were built upon during the first India-Cambodia Trade and Investment Business Forum, Exhibition and Buyer/Seller Meet in 2009, which sought to enhance economic engagement between the two countries. India extended duty free tariff preference schemes to Cambodia that same year. Indian businesspeople in Cambodia have also established an Indian Chamber of Commerce to promote bilateral trade and investment ties. India and Cambodia ties were further bolstered in 2011 when they held the first round of Foreign Office Consultations (FOC). These consultation were in regard to trade and bilateral cooperation, with a focus on policy, economy, security, education and vocational training, culture, IT and agriculture. The discovery of oil in 1929 brought a substantial number of Indians seeking their fortune to Brunei. Bilateral diplomatic relations between India and Brunei, however, were not formally established until 1984. In 2008, India-Brunei relations were enhanced in sectors ranging from agriculture and defense during the Sultan of Brunei’s visit to India. During his visit, five agreements were signed, such as the Bilateral Investment and Protection Agreement (BIPA) and the memorandum of understanding (MoU) on Cooperation in Information and Communication Technology. India also signed a free trade agreement (FTA) on goods with Brunei in 2010, which effectively slashed import duties on products ranging from seafood to chemicals and apparel. In return, Brunei also reduced import duties on various Indian goods. Over 40% of all the tourists coming into Cambodia are originated from another ASEAN country, according to statistics from Cambodia Ministry of Tourism. PHNOM PENH - Cambodia received about 1.51 million visitors from its ASEAN member countries last year, up 37 percent year-on-year, according to the statistics of the tourism ministry released on Thursday. The figure represented 42 percent of total foreign tourists to the country last year, the report said. Among the countries in the Association of Southeast Asian Nations (ASEAN), Vietnamese tourists to Cambodia topped the chart with its 763,100 citizens visited Cambodia last year, followed by Laos with 254,000 people came to the country. Thailand came at third with 201,400 tourists, while Malaysia and the Philippines came at fourth and fifth with 116,800 tourists and 97,500 visitors respectively, it said. In addition, last year, some 53,200 Singaporeans, 22,550 Indonesians, 4,750 Myanmar nationals, and 950 Brunei citizens had visited Cambodia. Ang Kim Eang, president of Cambodia’s Association of Travel Agents, said Thursday that the growth of ASEAN visitors to Cambodia was thanks to connectivity between Cambodia and those ASEAN member states by either land or air. Thailand and Cambodia have agreed to replace border troops with police ahead of the International Court of Justice’s (ICJ) oral hearings on the two countries’ territorial dispute. 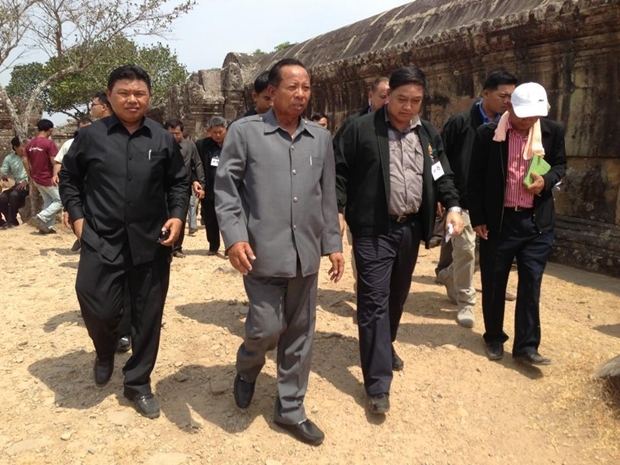 Defence Minister Sukumpol Suwanatat yesterday said he reached the agreement with his Cambodian counterpart Tea Banh during a visit to the Preah Vihear temple, at the centre of the dispute involving 4.6 sq km of border land. ACM Sukumpol said the bilateral redeployment shows the ICJ that both countries can handle the conflict in an amicable fashion. Gen Tea Banh said Cambodia will replace troops with border patrol police and will keep Thailand informed. He said it will probably happen before the ICJ’s oral hearings, which are scheduled for April 15-19. ‘‘Both of us agreed to mutual redeployment,’’ ACM Sukumpol said. Wage rise for garment workers in Cambodia still seems to be a far cry as the representatives of the employers and workers of Cambodian garment units have failed to agree on the amount of wage rise. At the wage negotiations being held under the guidance of Labor Advisory Council, the Garment Manufacturers Association in Cambodia (GMAC) offered to increase the minimum wage by US$11 from the current US$ 61 per month to US$ 72 per month. However, the US$ 11 amount was not acceptable to representatives of trade unions, who said the sum was too meager and demanded that the minimum wage be raised to US$ 120 per month. Speaking to media, Mr. Ith Sam Heng, Cambodian Minister of Social Affairs, said the Government is creating a working group comprising of representatives of workers’ unions, employers and Government officials. The working group would coordinate between the employers and the trade unions to reach an amicable solution at the earliest, the Minister said. Morning Glory, Cambodia, 2011. Rattan, bamboo, wire, plywood, steel bolts, 210 x 103 x 74 in. Lent by Tyler Rollins Fine Art. ©The Artist and Tyler Rollins Fine Art. NEW YORK, NY.- The Metropolitan Museum of Art presents ten works by the contemporary Cambodian artist Sopheap Pich (b. 1971). 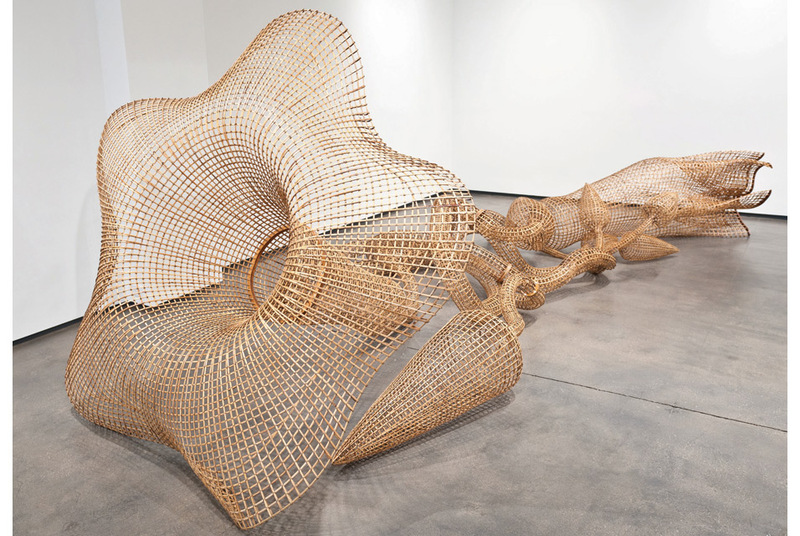 Drawn from U.S. public and private collections, Cambodian Rattan: The Sculptures of Sopheap Pich is part of the Museum’s contribution to the New York-wide Season of Cambodia, to be held in April-May 2013. The exhibition, which has been installed in three spaces in the Asian galleries, includes Buddha 2 (2009), an openwork construction of a Buddha torso, the lower half of which is unconstructed, allowing loose strands of rattan to hang freely. This work resonates strongly with Cambodia’s recent past: Cambodia is a deeply committed Theravada Buddhist society, whose faith was seriously challenged during the Khmer Rouge period, 1975-79. During these painful years, Buddhism was desecrated and officially discarded, allowing for an unraveling of Khmer society, a moment evoked in this work. Also on view is the artist’s recent work Morning Glory (2011), a spectacular large-scale construction with embedded memories of a time when much of the population was reduced to cooking the plant as a source of nourishment. A third work, Ratanakiri Valley Drip (2012), has more formal concerns, a lyrical study of horizon, vista, landscape, and earth, evoking the contemporary landscape of Cambodia. A Cambodian boy looks at the Prasat Chen temple in the Koh Ker area on May 14, 2012. For a year, an ancient Cambodian statue of a warrior has been at the center of a legal battle in New York in which US authorities back Cambodia's claim that the artwork was looted. A US lawyer has visited the temple as part of a legal bid to force auction house Sotheby's to forfeit the statue. AFP - A US lawyer visited a Cambodian temple Wednesday as part of a legal bid to force auction house Sotheby's to forfeit a 10th century Khmer statue so it can be returned to the country, officials said. Assistant US Attorney Sharon Levin, who heads the asset forfeiture office, visited the northern Koh Ker temple to see the pedestal of the contested sandstone statue known as the Duryodhana, said government spokesman Ek Tha. "She led a delegation to collect more data at the site in Koh Ker temple where the statue was looted," he told AFP, adding that Levin had also met officials working on the case since arriving in Phnom Penh on Sunday. The ancient Cambodian statue of a warrior is at the centre of a legal battle in New York. Cambodia claims the artwork was looted and US authorities filed a civil complaint last April against Sotheby's, blocking them from selling the item. "Her visit will help build a stronger case that the statue belongs to Cambodia," Ek Tha added. The US Attorney's office said in a statement last year that the Duryodhana statue was "stolen from the Prasat Chen temple at Koh Ker in Cambodia". PHNOM PENH (AFP): In a small room in the Cambodian capital, laboratory technicians wearing latex gloves and flip-flops inspect hundreds of buzzing white silkworm moths before pairing them up to mate. Now the country’s silkworms are once again under threat, but from a different kind of enemy. “Disease is killing more than 50 per cent of the silkworms,” said Mey Kalyan, director of the UN Food and Agriculture Organization’s (FAO) Cambodian silk programme. “Those that do survive are a third of the size compared to other regional producers,” Kalyan said. “In a nutshell, the (silk) farmers have stopped doing it. The weavers have stopped weaving and the plantations have stopped growing mulberries needed to feed silkworms,” he added. After three years of work, the researchers discovered a high-yield silkworm hybrid that feeds exclusively on cassava, something which is abundant in Cambodia. The fine texture and quality of Cambodia’s “golden silk” has been sewn by local reelers and weavers into some of the finest quality garments in Southeast Asia, but the trade is slowly dwindling into extinction. This article is a tribute to a distinguished field commander, Gen. Dien Del, of the Khmer Republic from 1970-1975 and of the Khmer People's National Liberation Armed Forces. Dien Del fought Vietnam's military occupation of Cambodia from 1979-1990. Born in 1932 at Soc Trang, Kampuchea Krom, now southern Vietnam, Dien Del passed away in Phnom Penh on Feb. 13. His body was cremated on the 17th. I knew Dien Del as a friend and a comrade-in-arms. We met in Cambodia when I took a semester out of graduate school to observe the situation in the field after the March 18, 1970, deposal of then Chief of State Prince Sihanouk. Dien Del was a lieutenant colonel. We did not meet again until sometime after May 1975, in the United States. This time, Dien Del was a refugee. The Khmer Republic collapsed on April 17, after the U.S. withdrew from the region. Most government members declined the U.S. offer to be airlifted to safety -- including Republican leader Prince Sisowath Sirik Matak, who was executed by the Khmer Rouge. A young rising star, Dien Del was a brigadier general commanding the 2nd Division in 1972, and was commander of the Territorial Forces and governor of Kandal Province from 1974 until April 16, 1975. His and others' dreams to set up a rear base in northwestern Cambodia as the Khmer Rouge entered Cambodia's towns and cities were thwarted because of volatile conditions on the ground, and their helicopters landed them in Thailand. At the end of May 1975, Dien Del, his wife, and two children, arrived as refugees in Alexandria, Va. I reconnected with him. Two years later, in May 1977, he left the U.S. for France. There he and Khmer senior statesman Son Sann formed a committee for liberation of Cambodia. On Feb. 1, 1979, he left Paris for Bangkok, and subsequently made his way to the border region. He persuaded 13 different armed groups to merge. On March 5, 1979, Dien Del proclaimed the Khmer People's National Armed Forces; he was named chief of general staff. ប្រជាពលរដ្ឋ​នៅ​ទូទាំង​ប្រទេស​កម្ពុជា និង​លើ​ពិភពលោក បាន​ដឹង​នូវ​រឿងរ៉ាវ​រំលោភ​បំពាន​ដីធ្លី ការ​បណ្ដេញ​ពលរដ្ឋ​ចេញ​ពី​លំនៅឋាន ដូច​ជា​ស្ថានភាព​ពលរដ្ឋ​បឹងកក់ បុរីកីឡា សហគមន៍​បឹង​ឈូក តាម​រយៈ​ប្រព័ន្ធ​ផ្សព្វផ្សាយ​នានា មាន​កាសែត វិទ្យុ ទូរទស្សន៍ គេហទំព័រ ទាំង​ជាតិ និង​អន្តរជាតិ។ ប៉ុន្តែ ប្រិយមិត្ត​អ្នក​ស្តាប់ អាន និង​ទស្សនា មិន​បាន​ដឹង​ថា តើ​ហេតុ​អ្វី​បាន​ជា​ក្រុម​អ្នក​យក​ព័ត៌មាន​តាម​ទាន់​ព្រឹត្តិការណ៍​ឈូស​ឆាយ ​ផ្ទះ​សម្បែង ឬ​ករណី​រំលោភ​បំពាន​ដីធ្លី​នោះ​ទេ? 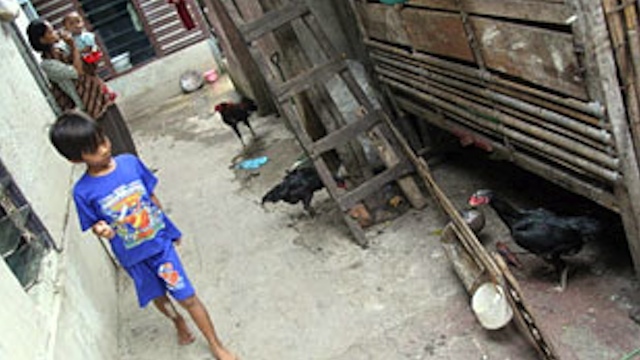 Bird flu epidemic in Cambodia? BIRD FLU BACK? Cambodia has recorded 30 human cases of H5N1 since 2003, with all but three of them proving fatal. File photo from WHO website PHNOM PENH, Cambodia- A 35-year-old man has become Cambodia's eighth bird flu fatality this year, prompting concern about the spread of the virus in the country, a health official said Tuesday, February 26. The latest victim, from the northeastern province of Kampong Cham, died on Monday night from the H5N1 virus in a Phnom Penh hospital, said Ly Sovann, deputy head of the health ministry's disease surveillance bureau. He said the man had eaten two ducks which had previously died before he became sick earlier this month. "We are really worried about the situation because in just two months we have nine cases of bird flu," Ly Sovann told AFP. Eight of the nine people died, along with thousands of birds in the villages where the victims lived. "There was a lot of dead poultry, but the people did not report to (officials). In the villages that I went to, almost all poultry had died," Ly Sovann said, adding it took up to a month for officials to be told of poultry deaths in some areas. The health ministry has enhanced surveillance to try to detect and treat avian influenza cases in the early stages, he said. Minister of Labor Vong Sauth (L) and Social Affairs Minister Ith Sam Heng (R) attend minimum wage talks, Feb. 26, 2013. A higher minimum salary for Cambodia’s garment and footwear worker is still not within sight after talks broke down Tuesday between unions representing the workers and their employers, officials said. The garment and footwear workers unions proposed to nearly double the current minimum monthly wage of U.S. $61 to U.S. $120, but the Garment Manufacturers Association in Cambodia (GMAC) offered to increase it only to U.S. $72. The large divide between the proposals by unions and the employers threaten to scuttle negotiations held by the Labor Advisory Council—which is comprised of government officials, union representatives, and employers. Cambodian Minister of Social Affairs Ith Sam Heng told reporters after the meeting that the government would continue to guide talks between the two sides, which are due to meet again on Wednesday. “We are creating a working group consisting of the unions, employers, and government officials to coordinate and reach a deal. I hope that within a few days we will find a solution,” he said.